Meet Diana Levin. A woman who has followed her passions throughout her life, and has been fueled by an admittedly high-level of energy inherited from her father! She is a woman who started traveling the world as a child with her mom, became a world class figure skater by the time she was a teen, and continues to lead an active life by surrounding herself with all types of people of all ages. World traveling is at the top of her hit parade list, but her roots remain in Chicago! Chicago is her kind of town, and she can tell some great stories......on how to grow older with gusto! Strength Training VRS. Obedience Training– OR Both!!! Who Is Methuselah and Do We Care? 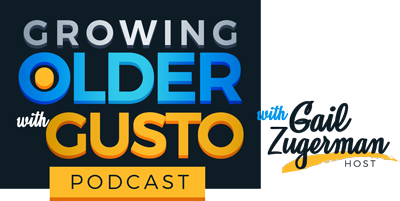 Please enter your name and email address to receive new episodes and helpful update from the Growing Older with Gusto team.